The Irish justice minister has said "every effort" will be made to get an Irish woman in Syria back to Ireland. 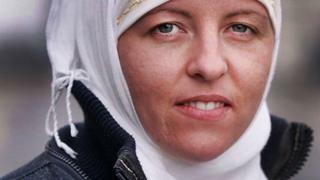 It has been reported that Lisa Smyth, a former member of the Irish Defence Forces, was radicalised and travelled to Syria a number of years ago. Charlie Flanagan said the government was trying to "ascertain the facts". He said while there was no consular presence in Syria, Ireland did have "good contacts... in terms of intelligence sources". Ms Smyth is from Dundalk in County Louth. It is reported that she has been detained by the US military. Speaking to Irish state broadcaster, RTÉ, Mr Flanagan said: "I do understand there is an Irish citizen who has been named in the media. "She's keen to come home. Every effort will be made on the part of the Irish authorities to ensure that she does get home. "You're talking about a situation of tremendous conflict, one of the most difficult conflict zones in the entire world." Mr Flanagan said the Irish government was talking to international colleagues to try to ascertain the facts. "If there are children involved, of course, we need to ensure there's an element of compassion there. "We would like to assist in every way possible. We don't have people there, I think it would be extremely difficult and challenging to have Irish people there." Ireland's Department of Foreign Affairs said: "The government is aware of media speculation and reports of an Irish citizen being held in Syria. "There has been no recent request for consular assistance from any Irish citizen inside Syria, which is an active conflict zone. It is not feasible at present for Irish consular officials to enter such a conflict zone." RTÉ has reported that the Gardaí (Irish Police) the Defence Forces and the Department of Foreign Affairs have had no contact with the woman since she left Ireland a number of years ago to travel to Syria.